Shopbop’s sale just got even better! The e-shop is offering an extra 20% off all sale items currently marked 50% and 70% off. There are some serious steals here! Since we’re on the subject of perfect party dresses today, how about this long-sleeve Raoul number? Or if you’re looking for a gift, take a look at this adorable Theadora & Callum scarf. 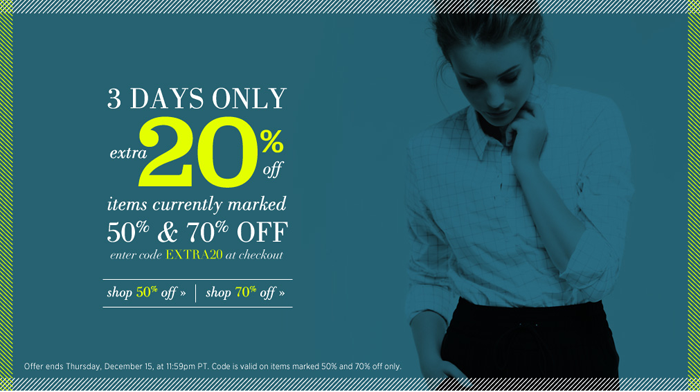 All you need to do is enter EXTRA20 at checkout. If there’s anything you’ve had your eye on in the sale, now is the time to start shopping. Dude so sweet. Thanks for the heads up.